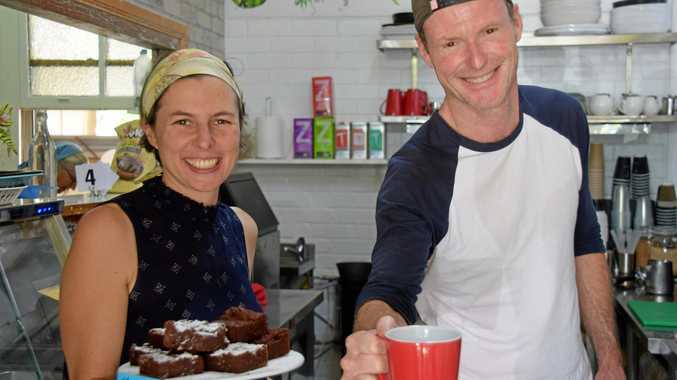 KINGAROY once again has a vegan cafe and Tuesday's opening day went off with a bang. Previously the location of the popular Giving Tree cafe, owner of the all new Nourish Cafe, Monique De Martin, was speechless when asked how she was feeling after day one of her new adventure. "I don't think I've got enough time to be tired," she said. The new cafe owner was grateful and overwhelmed by the support they had received on their opening day on Tuesday, October 23. "We had some friends that came in to have lunch and they ended up taking orders," she said. Mrs De Martin and her partner Alex have been amazed with the support of the local businesses who just want to see them do well. "Seng Refrigeration and Air Conditioning helped us with the fridges and they said there was no charge, they just wanted to support a new local business," she said. Mrs De Martin said customers didn't have to be vegans to find something they love at Nourish Cafe. "Most of the recipes are based on vegetables and nuts," she said. "There is no dairy, no eggs and lots of the salads don't have gluten." As a vegan, Mrs De Martin said she had her personal reasons for why she chooses not to eat animal products. "Being a city person you don't see all the trees that are cut down and you don't think of what it is doing to the environment because of the animals we eat, that's what it is for me," she said. "If I don't eat meat that means there is going to be more trees and more rainforests." Mrs De Martin said vegan based foods have plenty of variety and plenty of tasty options. "That's how we eat at home and I wanted to give that opportunity to others." Nourish Cafe is located at 194 Kingaroy St, Kingaroy.